There is something terribly disturbing about the cover of Ben Frost’s latest offering. Showing him hanging upside down, feet and hands wrapped in green plastic bags and tied together. Additional images of him lying on the floor looking half dead or of his head caught up in a strange metallic contraption further accentuate the feeling of unease that surrounds this release. While a definite stylistic slant, these images are more than just a simple visual translation of the content of the album. Hailing from Melbourne, Australia, twenty-six year old Frost relocated to the somewhat cooler Reykjavik in 2005 and teamed up with Björk collaborator and Bedroom Community label head Valgeir Sigurðsson. Prior to depositing his bags of noise on the Bedroom Community doorstep, Frost has been spotted on labels such as Room40 and John Chantler’s Inventing Zero. He has also been involved with various art installations and has worked on scores for films and dance companies. More recently, he has worked under the collective moniker of School Of Emotional Engineering and released a self-titled album, published on Architecture, in 2004. The scope of Theory Of Machines, Frost’s first offering for Bedroom Community, is rather vast, ranging from gritty guitar-fuelled cloudy drones to digital minimalism and greasy heavy rock. This album challenges and unsettles by its apparent inertia and the underlying perversion which results from the sometimes violent atmospheric shifts throughout. Nothing is quite what it seems here. Compositions that appear calm and introvert can erupt into raucous clouds or dense seismic formations unexpectedly only to be pulverized into minute particles. Elsewhere, Frost applies layer after layer of thick sonic foundation to form cyclical pieces. The album opens with the title track, which grows from an ethereal guitar line into a much grittier and sturdier edifice. We Love You Michael Gira works in similar ways, but the result is more subtle and delicate, despite the mind-drilling ring of an alarm clock pacing amongst abrasive glitches for a while. Stomp is a much more complex composition. Raising razor-sharp electric fences around pulsating electronic debris, Frost builds tension and gets under the skin of its audience, while Coda is a much rawer piece, with electric sparks flying across all the way through. The last track, Forgetting You Is Like Breathing Water is, in contrast, totally introvert and almost pastoral as Frost progressively applies an orchestral feel into his processed soundscapes. Ben Frost’s music is not exactly pretty in the esthetic meaning of the word, but the treatment he applies give his compositions an interesting sheen. 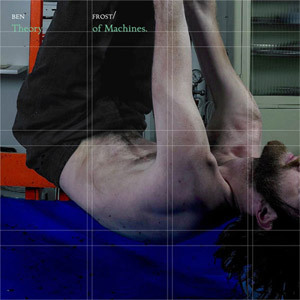 While the reaches of this album are, as its title indicates, somewhat mechanical and industrial, there is an organic thread which runs through each track, binding Theory Of Machines together beautifully.